For a slightly older film, Lincoln Lawyer's video quality is pretty good. Some scenes seem a little grainy but otherwise, the colors and presentation are solid. The audio is excellent with ambient sounds coming clearly through the side and rear channels delegating the dialogue nicely to the center channel. Matthew McConaughey (Dallas Buyers Club) has a certain charming quality about him. Whether he is playing a drug dealer in the 1970's or he is romancing a beautiful woman and melting women's' hearts everywhere, he always seems to come across a little bit like a used car salesman to me – but not in a bad way. He is smooth and likable and has a distinct and soothing voice. That is why he was the perfect choice to play Mick Haller in 2011's The Lincoln Lawyer, available now on 4K. Haller is a defense attorney in the Los Angeles area of California. With so many clients to see and running from court house to court house, he needs to have easy access to his office which is why he works out of the back of a Lincoln – giving him the nickname, The Lincoln Lawyer. When he manages to land a high profile client (Ryan Phillippe; Cruel Intentions) who is accused of assault and attempted murder, he may have bitten off more than he can chew. Louis Roulet (Phillippe) is a young man who comes from a wealthy family. When he gets arrested for assaulting a prostitute he claims he was assaulted, blacked out and woke up to being arrested. He claimed the prostitute was speaking to another man the same night and accused the mystery man of assaulting her. As Haller delves deeper into the case, he begins to see parallels between what happened that night and a previous case he worked on. Suddenly he realizes why he was hired to defend this man and doesn't know what to do. He can't quit, he can't tell what he knows or he will be disbarred, but his conscience doesn't want to let him help his client. This is probably one of McConaughey's better roles. As I mentioned earlier he plays the smooth lawyer with a thin layer of "smarmy" underneath. Luckily the character has only a small amount of smarm otherwise he could become very unlikable. McConaughey is surrounded by some other great actors including Marisa Tomei (My Cousin Vinny) as a prosecutor and Haller's ex-wife and William H. Macy (Shameless) as Haller's associate and investigator. Josh Lucas (Sweet Home Alabama) is also terrific and well cast as the prosecutor opposing Haller in court. For a slightly older film, the 2160p video quality is pretty good. Some scenes seem a little grainy but otherwise, the colors and presentation are solid. The Dolby Atmos audio is excellent though with ambient sounds coming clearly through the side and rear channels delegating the dialogue nicely to the center channel. The Combo pack comes with the 4K Blu-ray, regular Blu-ray, and digital download. There are a few extras including deleted scenes, Making the case: creating the Lincoln Lawyer, Michael Connelly: At home on the road and One on one with McConaughey and Connelly. All of the extras are interesting and insightful but I think my favorite is Connelly's tour around Los Angeles. Michael Connelly wrote a fantastic novel that was well adapted to the big screen. There are intricacies included that offer plot twists keeping viewers on their toes. The cast is well suited to their roles completing the look and feel of the film. While I'm not completely sure why this movie was chosen to be adapted to 4K over other titles, it's an excellent movie that is enjoyable to watch more than once. In fact, I'm sure you would find things the second and third time around that you never noticed the first time you watched it. 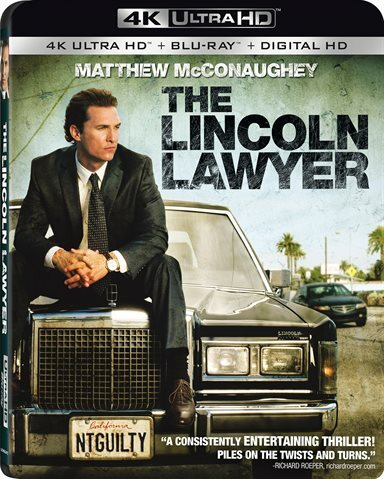 Download The Lincoln Lawyer from the iTunes Store in Digial HD. For more information about The Lincoln Lawyer visit the FlickDirect Movie Database.